The cell cycle allows multiicellular organisms to grow and divide and single-celled organisms to reproduce. All multicellular organisms use cell division for growth and the maintenance and repair of cells and tissues. Single-celled organisms use cell division as their method of reproduction. Somatic cells divide regularly; all human cells (except for the cells that produce eggs and sperm) are somatic cells. Somatic cells contain two copies of each of their chromosomes (one copy from each parent). The cell cycle has two major phases: interphase and the mitotic phase. During interphase, the cell grows and DNA is replicated; during the mitotic phase, the replicated DNA and cytoplasmic contents are separated and the cell divides. A human, as well as every sexually-reproducing organism, begins life as a fertilized egg or zygote. Trillions of cell divisions subsequently occur in a controlled manner to produce a complex, multicellular human. In other words, that original single cell is the ancestor of every other cell in the body. Once a being is fully grown, cell reproduction is still necessary to repair or regenerate tissues. For example, new blood and skin cells are constantly being produced. All multicellular organisms use cell division for growth and the maintenance and repair of cells and tissues. Cell division is tightly regulated because the occasional failure of regulation can have life-threatening consequences. Single-celled organisms use cell division as their method of reproduction. Cell Division and Growth: A sea urchin begins life as a single cell that (a) divides to form two cells, visible by scanning electron microscopy. After four rounds of cell division, (b) there are 16 cells, as seen in this SEM image. After many rounds of cell division, the individual develops into a complex, multicellular organism, as seen in this (c) mature sea urchin. While there are a few cells in the body that do not undergo cell division, most somatic cells divide regularly. A somatic cell is a general term for a body cell: all human cells, except for the cells that produce eggs and sperm (which are referred to as germ cells), are somatic cells. Somatic cells contain two copies of each of their chromosomes (one copy received from each parent). Cells in the body replace themselves over the lifetime of a person. For example, the cells lining the gastrointestinal tract must be frequently replaced when constantly “worn off” by the movement of food through the gut. But what triggers a cell to divide and how does it prepare for and complete cell division? The cell cycle is an ordered series of events involving cell growth and cell division that produces two new daughter cells. Cells on the path to cell division proceed through a series of precisely timed and carefully regulated stages of growth, DNA replication, and division that produces two identical (clone) cells. 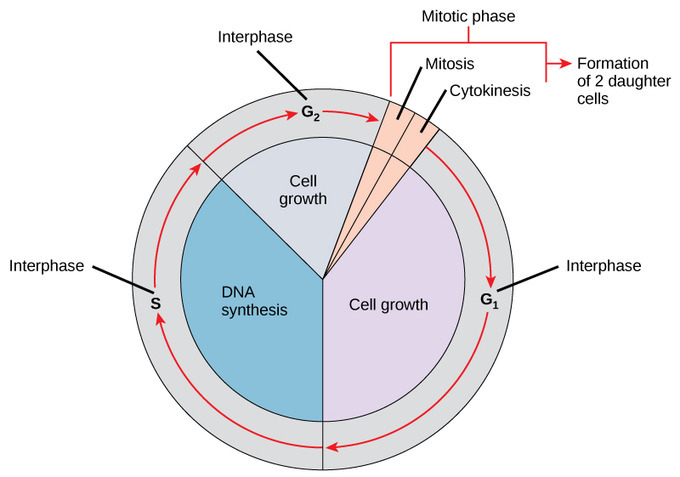 The cell cycle has two major phases: interphase and the mitotic phase. During interphase, the cell grows and DNA is replicated. During the mitotic phase, the replicated DNA and cytoplasmic contents are separated and the cell divides.